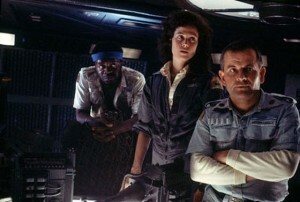 The Alien series of horror movies received a stunning high-defintion debut. In 20th Century Fox Home Entertainment‘s Alien Anthology Blu-ray, the four films look brilliant, especially director Ridley Scott’s (Robin Hood) original. High-definition shows off all the parts of Alien that haven’t been as noticeable until now, such as the photograph on the ship’s dashboard and the details in the alien ship. The colors are all more saturated in the film too. The blue in the fog in the alien ship, for example, and John Hurt’s blood in the infamous alien-bursting-out-of-stomach scene. The picture is sharp, which in some scenes makes the purposely-out-of-focus backgrounds look a bit off, because they are such a contrast to the sharper, in focus areas. The sound is awesome too, with the shrieks of the aliens, the screams of the people, the squelching of the blood and the eery scores so clear that they seep into viewers and stay there for days. By themselves, the movies, especially the first two, are prize enough for this set, but Fox outdid itself with the great book-like packaging, which includes six discs surrounded by wonderful pictures from the films. Those six discs, include the original theatrical version of the movies, plus their 2003 special editions, plus commentaries and special features. Most of these were created for the eight-disc Alien Quadrilogy DVD set released in 2003, but there are some new features. Even though a lot of special features aren’t new, they’re excellent additions to this Anthology set. The making-0f documentaries are fascinating, and truly give fans a horde of information from behind the scenes of these horror films. The documentary producers gathered all the major players, including actors and directors, plus many of the behind-the-camera crew members that made these movies so successful. All talk candidly about their experience on the Alien films, such as franchise star Sigourney Weaver’s (Avatar) insecurity about her first feature film, and, of course, all the details about the filming of the scene that got the franchise greenlit from the beginning: the alien bursting out of Hurt’s stomache. As well as interviews, the documentaries include behind-the-scenes photos, alternate shoots of scenes as well as other footage. The exclusive special feature on the Blu-ray is the interactive MU-TH-UR Mode. With it switched on, you can listen to commentaries and isolated score tracks, read trivia about the movies (a lot of which is repeated in the featurettes) and tag specials such as interviews, deleted scenes and featurettes. The tagging might confuse viewers at first, and the MU-TH-UR Mode tutorial won’t do much to help, but here’s the low down: As you watch each movie, you can tag the items you want to see related to that film, then play discs five and six and the Blu-ray system will remember which items you tagged and play them. It would be easier if you could tag and watch on the same disc, but judging by how great the movies look, we’re guessing Fox chose this way to save compression. All in all, the Alien Anthology Blu-ray is a great set for horror fans, especially lovers of these films.